Fr. 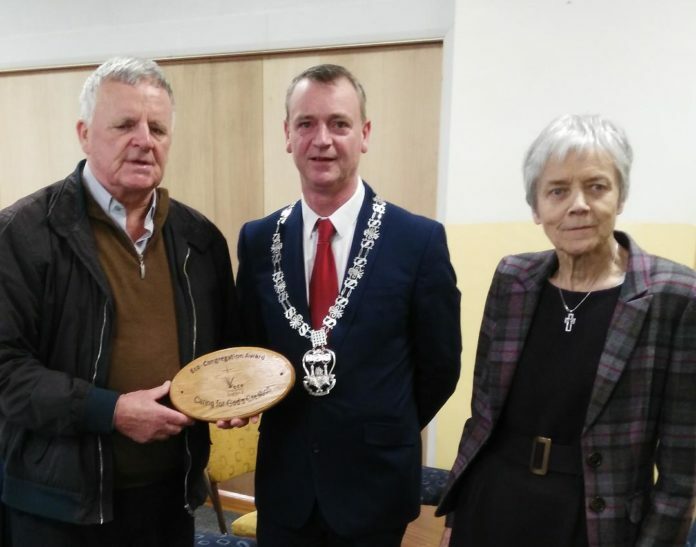 Michael O'Leary, PP, SMA Wilton, holds the Eco-Congregations Award in the presence of Cllr. Fergal Denney, representing the Lord Mayor of Cork, and Sr. Catherine Brennan, who presented it on behalf of Eco-Congregations. Sunday, November 3, 2018, was a momentous and historic day for the SMA parish at Wilton, Cork. After years of community collaboration and creativity, inspired by Pope Francis’ great environmental encyclical Laudato Si’, the parish was presented with the Eco-Congregations Award. This was recognized as a significant development both by the diocese of Cork and Ross and by the city of Cork, evidenced by the presence of Bishop Buckley and by Cllr. Fergal Denney, representing the Lord Mayor of Cork. “Parishes of today are more than the priest, the people, the liturgy, prayer and pastoral ministry. The parish of the 21st Century includes the whole bio region, the whole of the community of life: the air, the water, the climate, the soil, the crops, the trees, flowers and animals are all included. 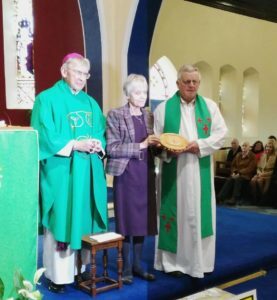 Fruits of the earth, grown in Wilton Parish, are presented during the offortory procession during Sunday mass, at which the Eco-Congregation Award was presented. Each creature has its own purpose. None is superfluous. 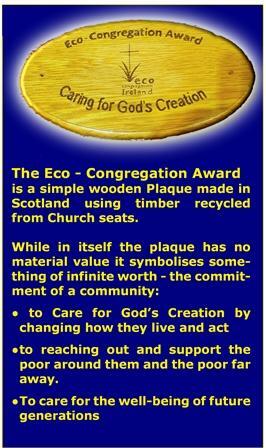 “The reception of the award from the Eco Congregation was a nice gesture for the parish. I found it significant because our parish in Wilton is not like most parishes, a church building and perhaps a priest’s house. Here in Wilton in addition to these we have a very active Parish Centre and the house for the retired SMA priests. We all had to come on board and play a part; we did and it was an interesting challenge for all of us. We send our congratulations to Fr. Michael, the Wilton Justice and Peace Group, and all other members of the parish community who worked so hard to achieve this prestigious award. We hope that it will be an inspiration to other parishes throughout Ireland to integrate creation theology and its practical expression in their expression of a living faith in Jesus, Lord of the Universe. To mark the occasion the following leaflet was produced. It outlines the efforts made by the Wilton parish community over the past two years to achieve the Award. To view the leaflet please click here.